[INQ. NO. 1508E15] Karak Electronics was founded in 1977 as a manufacturer of electronic components. Karak Electronics develops and sells total PA system solutions including hardware such as amps, digital network devices, and speaker systems as well as software. The company also makes digital and analog amplifiers and peripherals such as microphones, accessories, source devices such as CD players and decks, and mixers. With over 38 years of experience in the PA system industry, Karak offers an extensive line of popular products including the class-D PA amplifier system. This unit operates not only on IP-based networks but feature appealing designs and efficient interfaces. There are over 10 specifi c models, or the user can send in custom specifications which can be used to create a one-of-a-kind system. The wall-mounted portable PA system (Ceiling Power Amplifier), which can make you more competitive in the market, is composed of two parts – the one is a power amplifi er, KCA-60 (60W), KCA-120 (120W), KCA-240 (240W) and the other part is a pre-amplifier(KWM30H-hanging on the wall and KWM30E- embedded in the wall). The power amplifier will be installed on the ceiling of a room and the pre-amplifi er can be mounted on or embedded in the wall or front desk for control. This portable PA system is widely used in coffee shops, restaurants, small shops and offices. [INQ. NO. 1502E17] Karak Electronics was established in 1977, and specializes in the audio, video, security and PA (public address) system business. Over the past 30 years, Karak Electronics has focused on the development of highquality and innovative products in the audio and video field, and was designated as a promising medium-sized enterprise by the SMBA (Small-Medium Sized Business Administration). Moreover, the products developed and manufactured by Karak Electronics are distributed domestically through more than 50 dealers, and internationally through over 30 foreign distributors. Karak Electronics’ digital amplifier Prodigi Series are OTL, in other words, output transformer-less amplifiers. They can be automatically converted into DC24V in case of power failure. Also, the Prodigi Series adopted OTL SEPP circuit to provide high-power output with less space. 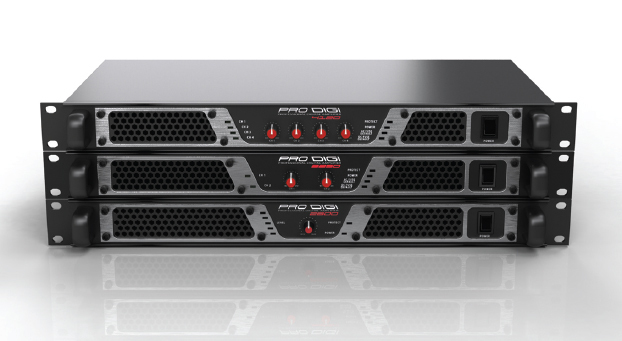 Compared to the existing amplifiers, the Prodigi Series are efficient in reducing the installation space. The highefficiency is based on Class-D amplification using the PWM method, and is lightweight thanks to its use of SMPS technology and SEPP circuit. The output DC is embedded with protection circuit for checking and preventing overcurrent and overheating, and remote controlling is possible through the power control terminal. 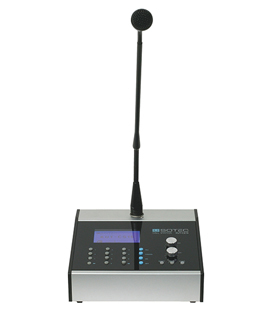 The portable PA system developed and manufactured by Karak Electronics is used for the communication and exchange of information. That is one way of doing multiple passes of the information of limited scope and space for people to target large-scale residential facilities so it is essential to install this system in the public facilities, transportation aviation facilities, buildings, commercial facilities, etc. The product is available embedded in the wall or by hanging on the wall. Main materials of the portable PA system are aluminum and plastic, and the portable PA system, wall mount series are provided in white color. To enable continuous development in technology, Karak Electronics established the affiliated R&D Center, to fully utilize the developed IT infrastructure to develop the newest concept of PA system for convenience in use and to provide flexibility to the extend system. Through the affiliated R&D Center, Karak Electronics developed several technologies and products, including the public address (PA) system, APT emergency system, touchscreen system, digital video recorder, U-SOTEC system, 5-Zone mixer amplifier, and many others. Karak Electronics registered and acquired numerous patents for its technologies and products, including the patent on equipment to fasten the speaker, digital PA system, illegal trespassing sensing system and the method, touch screen system, multi-date with single cable transmission and reception system, and many others. [INQ. NO. 1410E21] Karak Electronics was established in 1977, and specializes in the audio, video, security and PA (public address) system business. For the past 30 years, Karak Electronics had focused on the development of highquality and innovative products in the audio and video field, and was designated as a promising medium-sized enterprise by the SMBA (Small-Medium Sized Business Administration). Moreover, the products developed and manufactured by Karak Electronics are distributed domestically through more than 50 dealers, and internationally through over 30 foreign distributors. The PA system developed and manufactured by Karak Electronics is used for the communication and exchange of information. That is one way of doing multiple passes of the information of limited scope and space for people to target large-scale residential facilities so it is essential to install this system in the public facilities, transportation aviation facilities, buildings, commercial facilities, etc. The product is available for either embedding in a wall or by hanging on a wall. Main materials of the portable PA system are aluminum and plastic, and the portable PA system, wall mount series are provided in white color. The digital amplifier Prodigi Series are OTL, in other words, output transformerless amplifiers. The product can be automatically converted into DC24V in the event of a power failure. Also, the Prodigi Series adopted an OTL SEPP circuit to provide high power output with less space. Compared to the existing amplifiers, the Prodigi Series is efficient in reducing the installation space. The high efficiency is based on the Class-D amplification using the PWM method, and is kept lightweight by using SMPS technology and SEPP circuit. The output DC is embedded with a protection circuit for checking and preventing overcurrent and overheating, and remote control is possible through the power control terminal. To enable continuous development in technology, Karak Electronics established the affiliated R&D Center, to fully utilize the developed IT infrastructure to develop the newest concept of PA system for convenience in use and to provide flexibility to the extension system. Through the affiliated R&D Center, Karak Electronics developed several technologies and products, including the public address (PA) system, APT emergency system, touch screen system, digital video recorder, USOTEC system, 5-Zone mixer amplifier, and many others. Karak Electronics registered and acquired numerous patents for its technologies and products, including the patent on equipment to fasten speakers, digital PA system, illegal trespassing sensing system and the method, touchscreen system, multidate with single cable transmission and reception system, and many others. Karak Electronics was founded in 1977 as a manufacturer of electronic components. 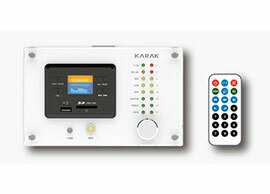 Karak Electronics develops and sells total PA system solutions including hardware such as amps, digital network devices, and speaker systems as well as software. The company also makes digital and analog amplifiers and peripherals such as microphones, accessories, source devices such as CD players and decks, and mixers. With over 37 years of experience in the PA system industry, Karak offers an extensive line of popular products including the class-D PA amplifier system. This unit operates not only on IP-based networks but feature appealing designs and efficient interfaces. There are over 10 specific models, or the user can send in custom specifications which can be used to create a one-of-a-kind system. The wall-mounted portable PA system (Ceiling Power Amplifier), which can make you more competitive in the market, is composed of two parts the one is a power amplifier, KCA-60 (60W), KCA-120 (120W), KCA-240 (240W) and the other part is a pre-amplifier(KWM30H-hanging on the wall and KWM30E- embedded in the wall). The power amplifier will be installed on the ceiling of a room and the pre-amplifier can be mounted on or embedded in the wall or front desk for control. This portable PA system is widely used in coffee shops, restaurants, small shops and offices. Karak Electronics was founded in 1977 as a manufacturer of electronic components. After adopting its current corporate name in 1997, Karak Electronics currently maintains its core competence in audio-video systems and safety/security systems. The company develops and sells total PA system solutions including hardware such as amps, digital network devices, and speaker systems as well as software. The company also makes digital and analog amplifiers and peripherals such as microphones, accessories, source devices such as CD players and decks, and mixers. With over 36 years of experience in the PA system industry, Karak offers an extensive line of popular products including the class-D PA amplifier system. This unit operates not only on IP-based networks but feature appealing designs and efficient interfaces. There are over 10 specific models, or the user can send in custom specifications which can be used to create a one-of-a-kind system. 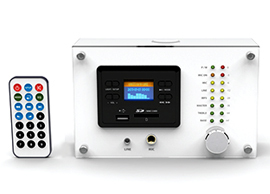 The 70/100V class-D PA amp with not output transformer is available with one, two or four channels, and features SMPS with PFC. The unit is slim and lightweight, and every Karak amplifier undergoes give stringent quality control evaluations to maintain the highest level of quality. Exporting to markets in Europe, the Middle East and Southeast Asia, Karak Electronics is currently expanding into the lucrative North American market. The company has received ISO 9001:2008 and ISO 14001:2004 certifications as well as the CE and CB marks. Filed Under: Find More Tagged With: class-D PA amplifier system, digital network devices, Karak Electronics Co. Ltd.